As a dedicated walker, I get an opportunity to observe joggers every day as they come slogging past me. And based upon years of study I can confirm that there is one obvious difference between female joggers and male joggers. It’s not speed, or running style — it’s attire. Women runners clearly have paid attention to what they are wearing. Their outfits are colorful and stylish, and they’ve clearly put time and thought into the clothing effort. Often their running shoes match their headwear, or gloves. Earlier this week I saw a young woman runner sporting a terrific color-coordinated ensemble with bright white shoes, striped red and white leggings, a red fleece jacket, and bright white earmuffs and gloves. She looked like she was jogging to the mall to get her picture taken with Santa Claus. The guy joggers? Not so much. They’ve apparently just rolled out of bed and rummaged through the dirty laundry pile to try to find their “lucky” sweatpants and a ratty sweatshirt. They pretty much look like crap as they go huffing and puffing around Schiller Park, and they obviously don’t care about it one bit. Since I have never been a jogger, I can’t speak to motivation when it comes to running, but I can certainly see how selecting the right outfit might actually contribute to the exercise effort. Careful attention to clothing is bound to help with the mental preparation for the run, and if you feel like you look ready for a good run it’s more likely that you are ready for a good run — just like kids who wore Red Ball Jets sneakers back in the ’60s felt like they could “run faster and jump higher” in those shoes than in others. The guy joggers need to up their game. Yesterday I got one of the endless number of emails trying to sell me something that bombard my inbox. This one was trying to sell me “Barbie PJs.” The picture showed what looked to me like standard PJs that were pink with a silhouette of a Barbie head on the top. “Hmmm,” I thought idly, “I wonder if Kish would like those, or hate them.” And then I hit the delete button. I wish I could effectively communicate to that company, and others that try to sell me women’s clothing, how absolutely unlikely I am to buy anything they’re offering. I haven’t bought Kish any kind of garment — or footwear, hats, you name it — for more than three decades, because I long ago learned that I have no sense of fashion and really don’t know what she likes and what she doesn’t like on the apparel front. In short, if an item can be donned or doffed, I’m far out of my depth. 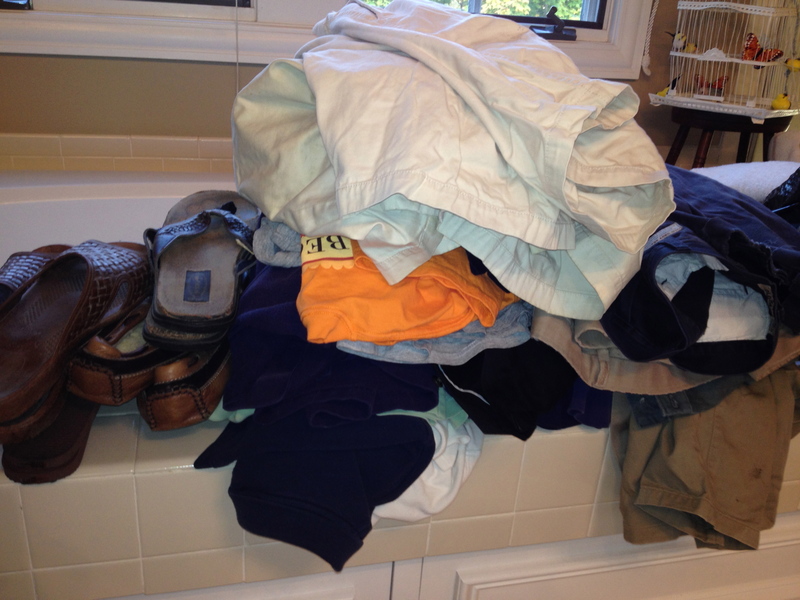 This profound condition of clothing cluelessness became clear when I tried to buy Kish some clothes one long-ago Christmas, and each purchase — boots, a blouse, a winter cap — was a miserable failure that she looked at quizzically. “How did you happen to buy purple boots?” she asked after opening one of the presents. “I thought purple was your favorite color,” I stammered in response. “No, it’s green,” she said. Fortunately, I had retained all of the receipts for the ill-advised gifts, so she was able to return them and get some things she really liked and wanted — and we moved forward with the implicit understanding that I would never again try to buy clothes for her. In fact, I’ve always suspected that the “returns” department at stores was created by a department store proprietor who, after totally flubbing some gift for his wife or girlfriend, realized that there was a desperate need for a special area where puzzled women could discreetly return the reckless clothing purchases of misguided males. So don’t try to sell me “Barbie PJs,” or poofy fashion scarves, or knee-high boots. Those kinds of purchases fall entirely into the “Kish self-purchase category.” I’ll happily buy her objects, or even perfume if I receive sufficiently explicit instruction that can be communicated to the helpful saleswoman at the perfume department at Nordstrom’s. Attire, however, is in the danger zone. The act of tying a tie is a simple one — and also a pain for those of us who toil in jobs where we still are expected to wear a piece of fabric cinched around our necks — but that doesn’t make its successful accomplishment any less satisfying. For most of us unfortunates, the act of tying your tie to get ready for work is as rote as tying your shoe or starting the car in the morning. The process is so automatic and ingrained you don’t even think about the individual steps. 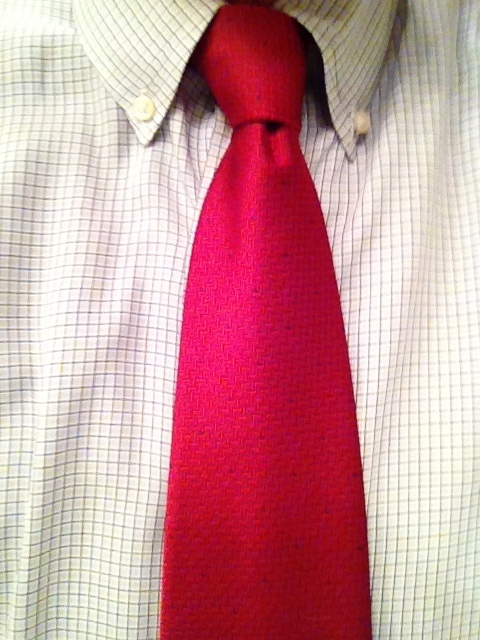 II don’t know the name of my tie-knotting technique and whether it produces a Windsor knot, a Four-in-hand, or something else. I just know that the chosen cravat is placed over my shoulders with the wide end on one side and the narrow on the other, and the relative length of each is adjusted by instinct. The wide end then is looped around the narrow, popped through a hole directly under my chin, and flopped on top of the narrow end and drawn down to make a reasonably acceptable knot. The last step is to tug down the narrow end until the gap between the tie and the shirt collar is closed and the button is no longer visible. Voila! If I can accomplish this and avoid the dreaded “Oliver Hardy” look — where the narrow end is longer than the wide end, which ends up flapping forlornly on the belly — while also having the wide end reach belt level, the operation was a success. Extra points if I meet those goals and also produce the perfectly centered dimple. It’s the little things, especially on a Thursday morning. My work winter coat is a navy blue cloth greatcoat that extends down to about knee level. It’s sturdy and warm and reasonably professional looking — and also seems to magically attract every strand of white dog hair in our household. When you live in a house with two dogs, dealing with dog hair is just part of life. When we’re gone our dogs jump up on chairs, flop down on rugs, and leave their fur behind. You can brush their coats regularly, sweep and vacuum repeatedly, and flap out rugs until you can flap no more, but dog hairs are always going to be there, ready to leap onto any item of dark clothing and make you look like a vagabond who’s been sleeping with a pack of strays in a downtown alley. In our household, we deal with the dog-fur-on-clothing issue by owning approximately two dozen adhesive rollers designed specifically to remove hair from garments. 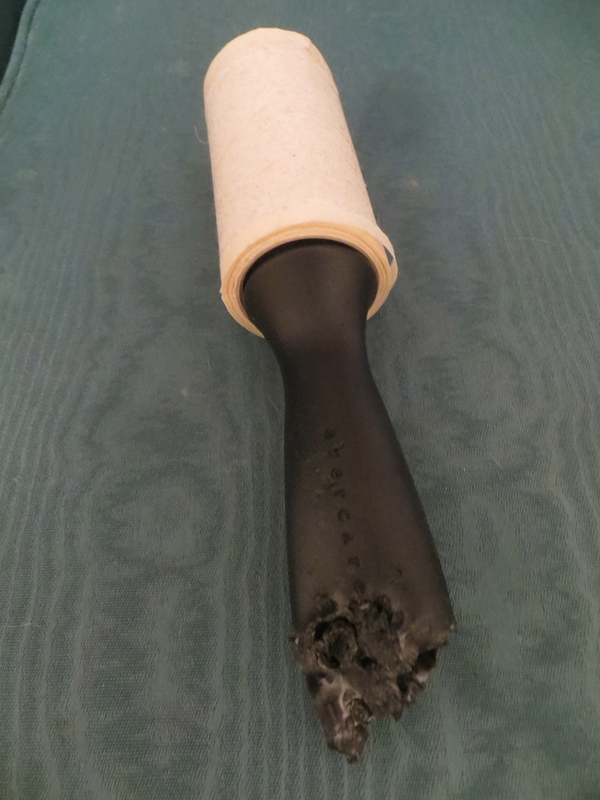 (Of course, the plastic handles of the rollers have all been chewed to smithereens by our dogs, which is just another fun thing about life with dogs.) Although the rollers are designed to remove hairs and pick up most random items, they don’t do an especially good job on dog hairs. The only real way to remove dog hairs from your coat is to exercise your fine motor skills and individually remove them, hair by stinking hair. That is because dog hairs are clingier than your two-year-old at his first terrifyingly large family reunion. Dog hairs have a special bonding property that makes them stick — well, doggedly — to any dark item of clothing. In fact, I wouldn’t be surprised if the NSA is attempting to build listening devices into strands of dog fur to assist in its surveillance programs. Because the NSA apparently monitors just about everything, and dog hairs can be found just about anywhere, it seems like a match made in heaven. When the dogs and I stepped outside this morning, my breath was faintly visible and a distinct chill was in the air. When we got home I checked the weather app on my iPhone and saw that the temperature is supposed to reach the 50s and perhaps touch the low 60s today. I therefore declare this First Sweater Day. It is not officially recognized, of course, but it is important nevertheless. It marks the first day that I can wear a sweater to work. It has to be on a Friday, when the casual dress rule prevails, and it can’t be declared too early, when wearing a sweater would leave me uncomfortably warm. It arrives in Columbus at a different date than it would in, say, Minneapolis or Portland, Maine, where First Sweater Day probably came weeks ago. But when the air outside has begun to acquire that gelid feel, and leaves are scattered on the sidewalks and roadways, and pumpkins appear on the porches of your neighbors, you know that First Sweater Day is here. First Sweater Day is one of those real-life demarcations of the seasons, just like the start of school or the beginning of the fall TV season used to be. 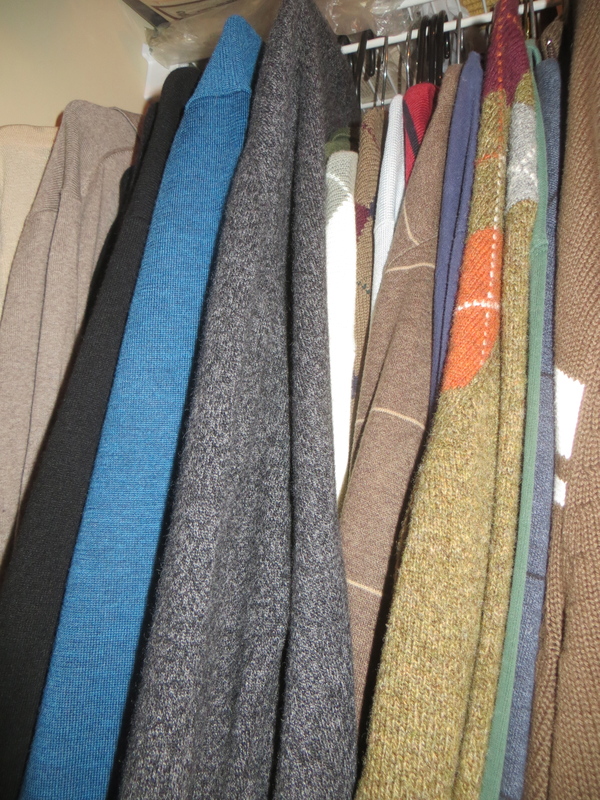 Donning a sweater today will help me to stave off wearing any kind of overcoat for a while, and from now on, as we move more deeply into the layering season, sweaters will be a staple of the wardrobe.